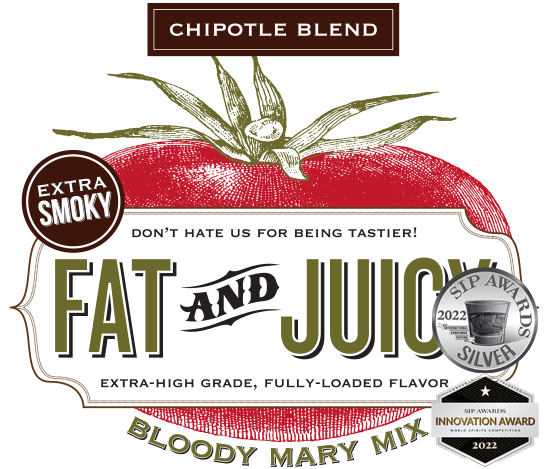 Fat & Juicy Chipotle Bloody Mary Mix is our answer to those that want to amp the sultry smokiness! We've taken fresh chipotle peppers and added them to our vine-ripened 'fat and juicy' tomatoes and a signature mix of roasted vegetable purees, fresh horseradish, celery, garlic, and a sultry smoky heat for a party ready cocktail anytime, anywhere. This is just like our original, but is Extra Smoky!! If you want, garnish with some of our favorite things, like pickled okra, dilly beans, or a piece of bacon! Fat & Juicy also adds that perfect flavor to dishes like meatloaf, chili, pot roast, or pasta! mix contents, garnish, and enjoy! !